TT: Hi-Ho? Not These Dwarves! JANE: Over the last couple of weeks, we’ve been discussing the various races that J.R.R. Tolkien forever made part of the landscape of Fantasy fiction. It would probably shock many current Fantasy readers to realize that before this novel few – if any – Fantasy novels incorporated a suite of races that has now become routine, if not cliché. ALAN: That’s exactly right. Pre-Tolkien fantasy, while it was full of wizards and magic, was almost exclusively human. The classic novel from this period is E. R. Eddison’s The Worm Ouroboros which tells of the war between Witchland and Demonland. In the course of telling his tale, Eddison also mentions Goblinland and Pixyland and at one point in the story a dwarf appears. However Goblinland and Pixyland are just country names, and even though the inhabitants are referred to as goblins and pixies, Eddison does nothing at all with the idea and it is clear that the goblins, the pixies and all the other characters are human. 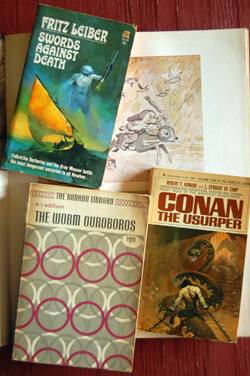 Similar comments can be made about other fantasy worlds such as Fritz Leiber’s Fafhrd and Gray Mouser stories and the Conan the Barbarian fantasies written by Robert E. Howard. JANE: Oh, absolutely. I’ve always assumed that Shakespeare’s characters had an influence on how Tolkien depicted his elves. A few weeks ago, you talked about how hippies really identified with hobbits, and that wizards also entered the cultural landscape. The popularity of elves, however, seems to be a somewhat later phenomenon. Did dwarves make a larger cultural impact? ALAN: I think dwarves have always been part of popular culture – I seem to recall them appearing in a lot of fairy tales. JANE: Good point. It’s rather strange, but dwarfs, especially treasure-mongering sorts, appear in many fairy tales, in a way that elves do not. Tales about elves are more likely to be legend lore, rather than fairy tale. I also think Walt Disney’s depiction of Snow White and the Seven Dwarfs had a lot to contribute to keeping dwarfs in the popular eye. So, how do you – personally – feel about dwarves? ALAN: I’ve always had quite a soft spot for Tolkien’s dwarves. Certainly they were isolationists, preferring their delvings under the mountains to any involvement in the larger affairs of Middle Earth. Nevertheless they could not shut the world away completely and they suffered great tragedies as a result. I always felt a little bit sorry for them because of the troubles they had to live through. JANE: My response to dwarves is much like yours. Especially in The Hobbit, we get a good look at their interactions and differences in personality. Because of this, they always seemed more three-dimensional than the elves, since the only elf we get to know really well is Legolas. However, the dwarves indirectly lead to one of my biggest disconnects with Tolkien’s work. JANE: When I was in college I read a translation of Snorri Sturlusson’s Poetic Edda. Imagine my surprise when, in a piece about the origin of the dwarfs, I found a bunch of familiar names, up to and including Gandalf. I realized that Tolkien had cribbed them entirely from Old Norse. It’s startling to come across someone’s source quite so blatantly. Whenever I’d hear people rave about Tolkien’s brilliant naming, I’d often point out he’d just swiped them. ALAN: Not only did Tolkien swipe them, he also slightly misappropriated them. Gandalf was actually the name of a dwarf in the Völuspá, the first poem of the Poetic Edda. I can’t remember when or how I discovered that, but it definitely gave me a moment of culture shock when I did! JANE: Tolkien must have liked the name Gandalf, because the character who would become Thorin Oakenshield was originally named Gandalf. However, Tolkien later changed his mind and Gandalf became the wizard instead. Many years later, I learned that Tolkien himself regretted his wholesale use of the names from the Poetic Edda. It was one of the reasons he came up with the elaborate justification that the “Lord of the Rings” is actually translated from other languages and that the names in it are, in many cases, not the actual names, just borrowings to make translation easier. ALAN: But that “elaborate justification,” to use your very appropriate phrase, is one of the major things that makes the world of Middle Earth feel so real and so full of history. So I think Tolkien can be forgiven his original theft of all those names because of what it led to. After watching all three Hobbit movies, I re-watched the Lord of the Rings, and I confess that I got a big lump in my throat when Gimli came across Balin’s tomb in Moria. His grief was palpable, and because I had grown so close to Balin, so was mine. JANE: I always loved Balin. He had a groundedness (pun intended) that Thorin – obsessed as he was with the Arkenstone of Thrain – lacked. Honestly, he would have been a better leader all along. Like Elves, Dwarves have shown a lasting appeal. They are popular characters for role-players, and I suspect that if they weren’t usually defined as essentially non-magical – even resistant to magic – they would be even more so. JANE: Oh! Absolutely… But many role-players want to be able to do fancy magic, and if you play a dwarf, that’s out. A great example of the appeal of dwarf can be found in the work of author Dennis McKiernan, whose first novels were an attempt to provide a backstory for the entire “Lord of the Rings” trilogy from the point of view of the dwarves. I should note here that Dennis was an electrical engineer at the time and had no idea about literary rights. However, he’d always loved the books, thought that there was more story behind the dwarves involvement. When a motorcycle accident put him in bed with two broken legs, he decided to write the dwarves’ story. Doubleday was interested and apparently tried to get permission from the Tolkien estate to publish them as prequels. When the estate would not give permission, Doubleday thought (correctly) there would be an audience for the tales, and asked Dennis to rewrite, creating his own world to set the story in. These books were eventually published as The Iron Tower trilogy and became the basis for McKiernan’s Fantasy realm of Mithgar. ALAN: Another good example of the enduring popularity of dwarves comes from the German writer Markus Heitz. He has written a whole series of novels about dwarves, some of which have been translated into English. They seem to be quite popular. I’ve not read any of them myself, but a friend of mine whose judgement I trust is particularly fond of them. It seems that dwarves are everywhere. I actually know a dwarf in real life. He’s a very tall dwarf, about six feet tall in every direction. But nevertheless he’s a dwarf. JANE: Okay… I’ll bite. How do you have a dwarf who is six feet tall in every direction? ALAN: It’s simple – I know an actor who was one of John Rhys-Davies’ body doubles (Rhys-Davies played Gimli in the movies). Peter Jackson really does enjoy making life hard for himself – both men are very tall and very bulky, not dwarf-like at all! JANE: Bulky works for dwarves… Doesn’t it? I wonder why the body-double, at least, wasn’t shorter. Probably has something to with the CGI work. I thought John Rhys-Davies did an excellent job with Gimili, despite the height disadvantage. Now, I feel we can’t discuss dwarfs – or dwarves – without a mention of where the plural “dwarves” originated. Do you know? ALAN: No, I don’t. Is that what they call a trick question? JANE: Not really… It fits our discussion perfectly. Tolkien actually created the word. “Dwarves” (rather than “dwarfs”) was a plural he came up with, later regretted as “ungrammatical,” but by then it was established enough in his writings and in his own mind that he stayed with it. So, in addition to fleshing out dwarvish culture and taking them from myth and fairytale to popular figures of Fantasy fiction, Tolkien also gave them a new plural! ALAN: I suppose that’s what happens when you are a philologist! JANE: Now, we’ve left one mysterious and important race out of our discussion… Perhaps we can pursue it next time! This entry was posted on June 4, 2015 at 1:00 am and is filed under Thursday Tangents. You can follow any responses to this entry through the RSS 2.0 feed. You can leave a response, or trackback from your own site. Gee, and here I was, thinking of Pratchett’s Casanunda as I read this. And dwarf bread. And dwarvish gender politics, which might be different than dwarfish gender politics, I suppose. I’d point out the similarities between Thorin and the Arkenstone and Alberich and the Rheingold in Wagner’s Ring Cycle. I just spent a few minutes searching Wikipedia for the texts and traditions Wagner drew on, and quickly decided it was too big of a subject for right now. But I’m sure Tolkien would have been familiar with those. But magic rings, dragons, treasure hoards, and so forth are all straight from Germanic traditions But fleshing out the entire culture like that definitely seems to be Tolkien’s innovation. Another question: How should “Tolkien” be pronounced? I’ve heard the final syllable with a long “e”, a long “i”, and a short “i” (Tol-kene, Tol-kine, Tol-kin). What did he call himself? It’s “toll-KEEN.” I say it wrong on panels all the the time. Hmmm… I take it that you’re not a fan of Lin Carter? His A Look Behind the Lord of the Rings was the best of a late-60s cottage industry devoted to examining Tolkien’s sources. He even quotes the passage from the Poetic Edda where Gandalf appears, and notes that the name translates as ‘Magic Elf’. Which strikes me as a lot more appropriate for a wizard than a dwarf, come to think of it. In the late 60’s, I was still in single digits. I certainly wasn’t indulging in the output of this particular cottage industry!